Jimmy Van Bramer once again is going for the media attention instead of doing whats right for Long Island City. Van Bramer who is a notorious a media whore, said in a letter with other politicians to Mayor De Blasio that he supports the Amazon Headquarters in Long Island City. In a story in the LIC Post on October 19, 2017, Van Bramer supported along with other politicians Amazon having a headquarters in Long Island City. 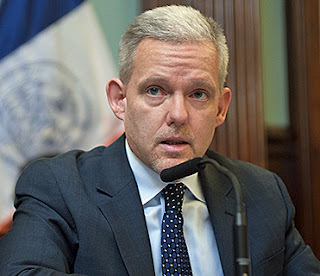 LIC Post - Letters of support for Long Island City as a possible site were also sent to de Blasio by Queens Borough president Melinda Katz and Assemblymember Catherine Nolan, with Council member Jimmy Van Bramer also expressing his support. All three signed a letter, along with more than 70 elected officials from the five boroughs, sent to Amazon CEO Jeff Bezos, on New York City’s potential as a home for Amazon HQ2. Once again our Media Whore we in Long Island City call Van Bramer and his politicians friends, have FLIPPER-FLOPPED and leaving Long Island City Residents to pick up the pieces. Our trains are already overcrowded, there is not reliable bus service and having Amazon here where their employees will use our system, not only to get to and from work, they will be riding our subways to deliver packages. These are facts. If Jimmy Van Bramer really cared for Long Island City, he would stop playing the media game and stop flip-flopping of issues important to residents. Van Bramer supported this project. Van Bramer and his cronies sent letters supporting this project. We would not have this project if these politicians did not support it from the beginning. Maybe if Jimmy Van stopped blocking residents who complain on Twitter, he would know what the community wants. Once again, SHAME ON JIMMY VAN BRAMER !